EmeraldCityEDM | USC Events: Lucky 2015! 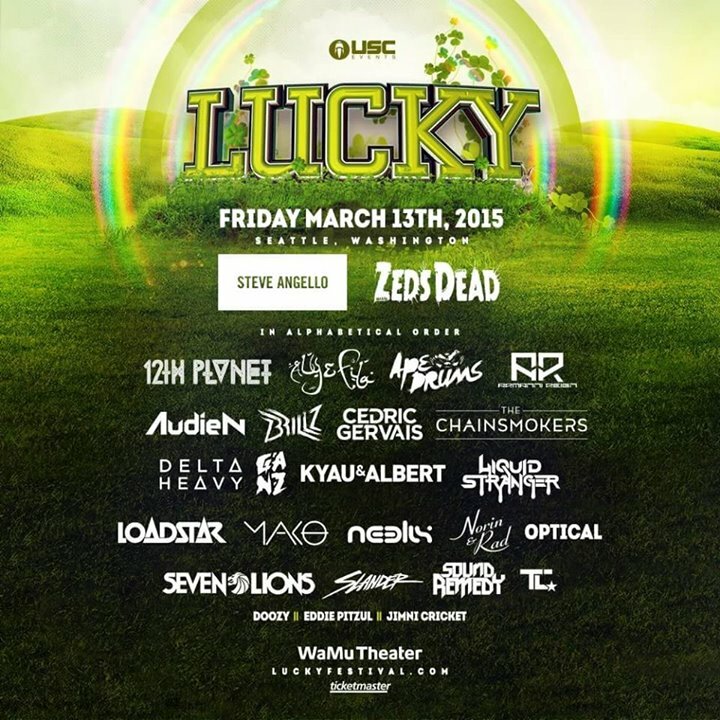 USC Events presents Lucky 2015 on Friday, March 13th 2015 at the Wamu Theater with headliners Steve Angello and Zeds Dead, along with 12th Planet, Aly & Fila, Ape Drums, Armanni Reign, Audien, Brillz, Cedric Gervais, The Chainsmokers, Delta Heavy, Ganz, Kyau & Albert, Liquid Stranger, Loadstar, Mako, Neelix, Norin & Rad, Optical, Seven Lions, Slander, Sound Remedy, TC, and local support by Doozy, Eddie Pitzul, & Jimni Cricket. Spring is the time of renewal and abundance; it brings new life and the resurrection of nature after winter’s cold. A spring festival proclaims the sun’s warming, welcoming rays and the good fortune to come as we head full speed into a new year! Spring brings a promise of more prosperous days, and marks a time to celebrate with a little luck of the Irish at Lucky 2015. On March 13th, you are invited back to an Celtic-inspired playground where the Emerald City becomes the Emerald Isle! As luck would have it, we will be visited by magical creatures, immersed in unparalleled St. Patrick’s decor and production, and the sounds of artists from far and wide. Start planning your green and gold garb now and get ready for the luckiest adventure of the year! After many discussions with the venue, the decision has been made that all policies implemented at Resolution will be in place for Lucky. This includes the same security screening procedures, line entry, and the bathroom door removal policy. We have read stories circulating that say the door removal is in violation of the building code, but the venue has insisted that this is not the case. NOTE THAT NO BAGS WILL BE ALLOWED AT LUCKY unless they are CLEAR and smaller than 12x12x6. See the full rules & restrictions as outlined by USC Events online here. 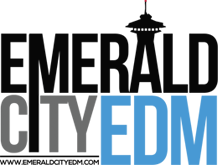 –Win a meet & Greet at Lucky with Aly & Fila! We are working diligently to get the Lucky 2015 lineup confirmed and approved so we can announce it for you. Thank you for being patient while we work through the snags. We promise that we will start announcing Lucky artists the moment we are able to! In the meantime, tickets will go on sale this Friday at Noon PST for those that choose to get their tickets early. Retail ticket outlets: A limited amount of 71$ cash only tickets will be available in Seattle at the following locations. See all of the PNW hard copy ticket outlet locations as detailed online here. Don’t forget to stay up to date on local EDM events happening in Seattle by following the EmeraldCityEDM Upcoming Event Calendar!